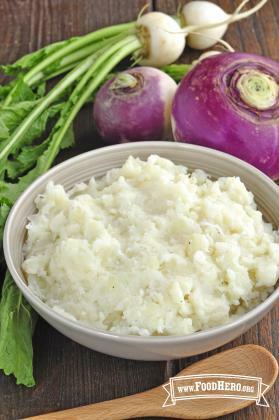 Boil turnips and potatoes in enough water to cover until tender, 15 to 20 minutes. Stir in sour cream, salt, pepper, and garlic powder. Serve hot. 1 Comments for "Mashed Turnips and Potatoes"
Doubled this recipe using 1/4 cup of both light sour cream and buttermilk as I couldn't decide which to use. Turned out great and everyone loved it!